We got going at our regular 7am time, but we left on a mission. 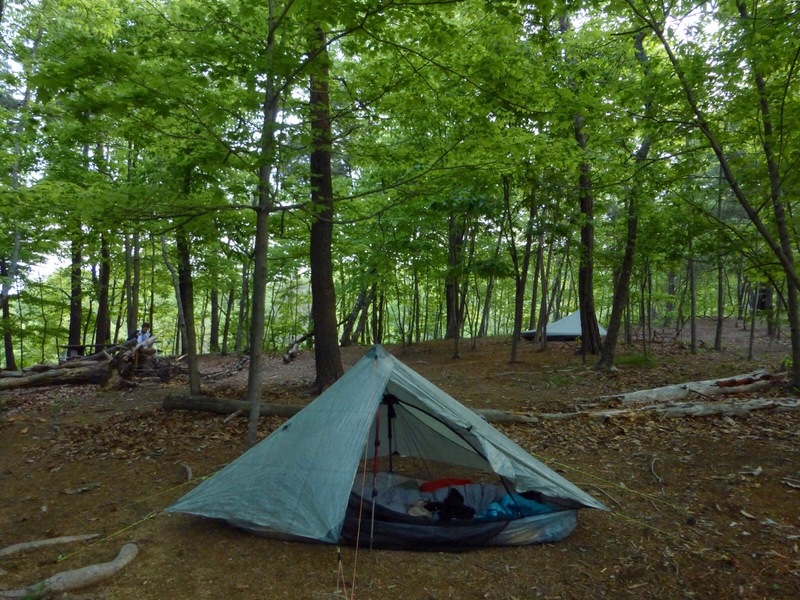 I usually don’t pick my campsite until later in the day based on where I am, but the area we were entering is part of National Park Service Land and backpackers are supposed to camp at shelters or specified campsites. That meant we were either doing a shelter around 23mi or 25mi. 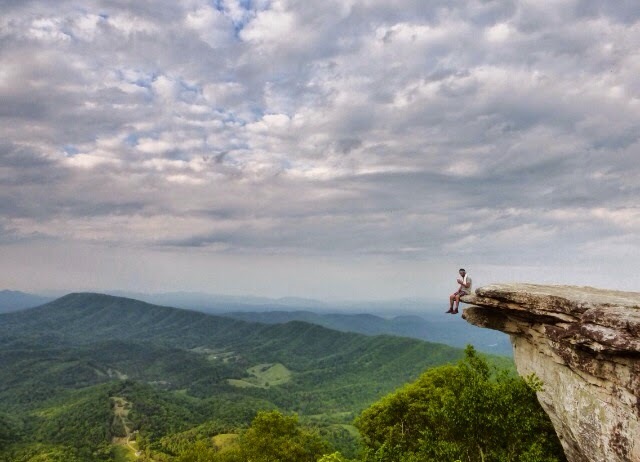 We also saw that one of the most photographed destinations along the AT, McAfee Knob, was at mile 25 for the day and we wanted to try to make it there. This is our fifth day in a row of hiking over 20mi/day and it’s hard on Ferris who is new to hiking. I get pumped with goals and oddly still feel energized and speedy despite so many days out. I know it’s not fun for him to be around that when his body isn’t accustomed to the mileage and he has new shoes waiting for him in town, but he’s been a real good sport about it. 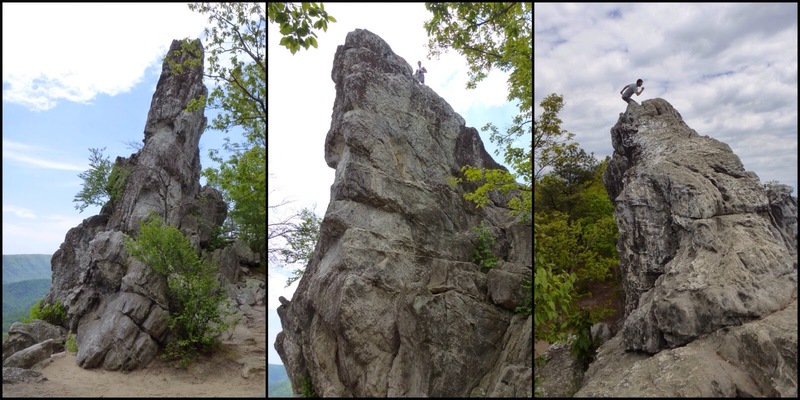 Our goal was to have lunch at Dragons Tooth, which is a large rock formation. The morning hiking had a long gradual up and down that was enjoyable and the temps were still nice in the 60s and cloudy. 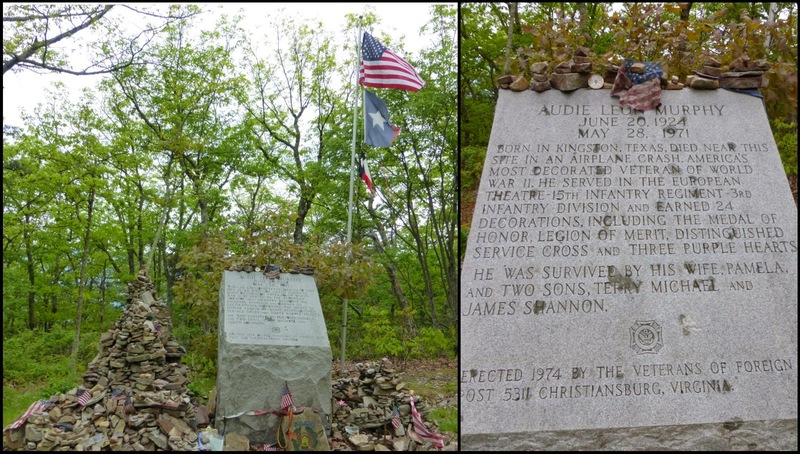 There was a short side trail to see the Audie Murphy Memorial. He’s the most decorated American Soldier of WWII who crashed in a plane near the memorial site. It was a moving memorial with many trinkets and things left there along with a flagpole. We passed three other thru hikers that were young guys and they overlapped with us at Dragons Tooth the guys and Ferris were more adventurous than me about climbing on it and I took some pictures of Ferris safely from the ground. The afternoon dragged a bit as the sun broke through and it warmed up a bit. I was sweating for the first time this leg since it’s been so cool. 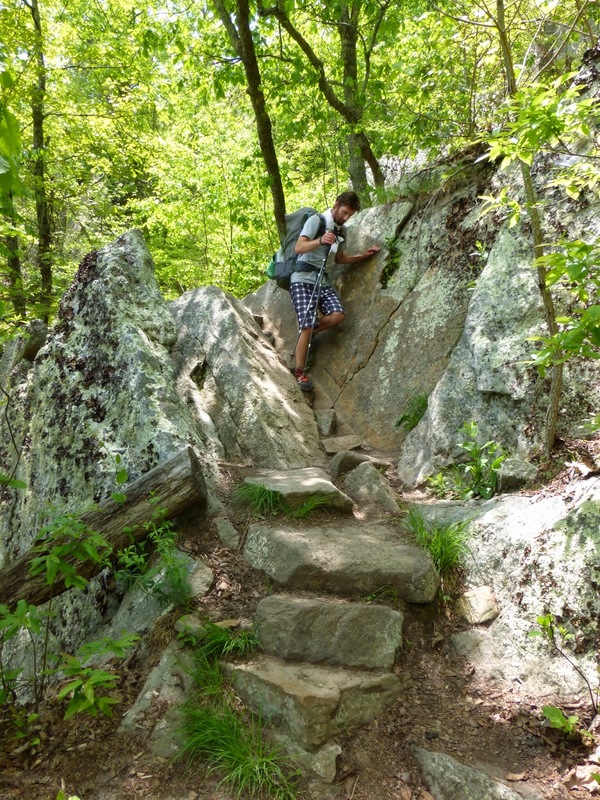 The first mile down from Dragons Tooth was really rocky with huge slabs of rock we had to slowly inch our way over and through like an obstacle course. I was so busy watching my step I only took one picture of it. At one point I rolled fat ankle(ankle I haven’t had surgery on that still rolls and swells so I named it after Fat Amy in Pitch Perfect). It’s been great all hike and rolled every so often, but no pain or swelling. It ached the rest of the day after I rolled it, so I’ll wear the brace I carry on it tomorrow to be extra cautious. 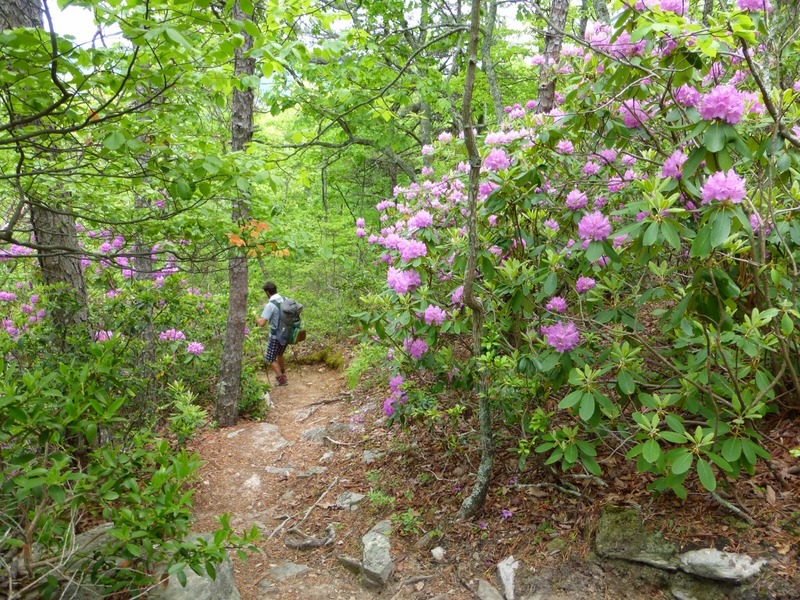 Just after the rocky section we hit a stretch of rhododendrons in bloom more than we’ve seen so far. Ferris mentioned his mom has a rhododendron bush at home and that she’d appreciate a photo so I tried to get one. It’s something that is even cooler in person though. 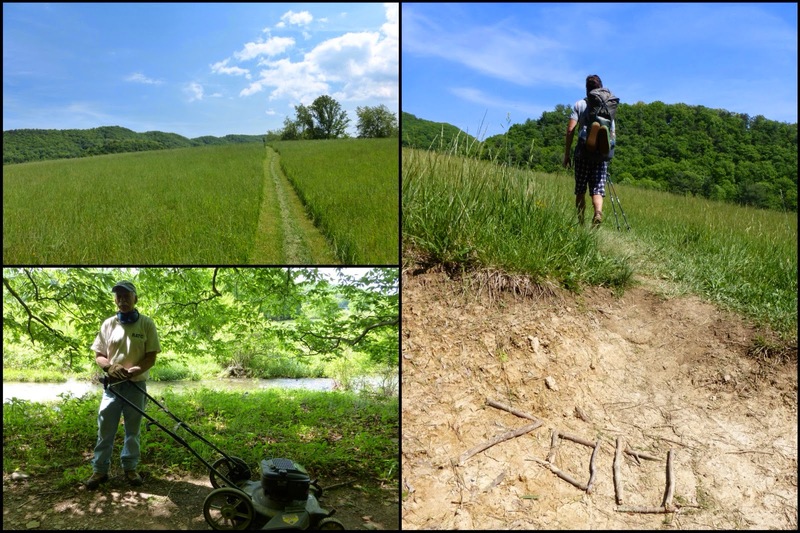 We went through a pasture and there’s was a nice wide path newly cut for hikers. I commented on it and just a mile later, we came across Maurice, the caretaker for that section who was mowing the grass. I just had to get a picture and thank him for his volunteer work along the trail. It’s also the section where we hit 700mi, wahoo! It was the last three hours of the day that was toughest for us as we both seemed to slow down despite okay terrain. I got a second wind and was thankful for that. Ferris gutted it out and said his feet were hurting enough that he considered taking a zero when we get to town tomorrow instead of hiking out with me another 24hrs which I explained yesterday is the new plan to be able to eat at the Homeplace on Thursday (tomorrow is Wednesday and they aren’t open). He’s going to see how the hike into town tomorrow goes and keep his options open. We made it to McAffe Knob by 6:45pm and it was perfect up there! Getting good views can be difficult on the AT with haze, fog, and rainy weather so we were really excited to be up there on a great night. We stayed up there awhile and took all sorts of pictures and Ferris was able to FaceTime his dad which I got a picture of too. We got to camp just a half mile past the knob at 7:45pm, but we agreed that it was well worth a later camp time to be up there on such a great night. It’s a great campsite with pine needles on the ground and even a picnic table. A good end to a long day!